SINGAPORE - A beauty queen who was seeing two men at the same time has told a court how she saw one of them kicked and punched by an intruder - three weeks before his face was slashed by an alleged hitman. Ms Audrey Chen Ying Fang, 27, said she was at home with Mr Joshua Koh Kian Yong, 32, on April 8, 2016 when two men - whom she identified as her other boyfriend's son and nephew "Ron" - turned up at the flat. Ron assaulted Mr Koh for 10 to 15 minutes, causing injuries including a broken nose, while the son - who was not named - sat and played with her dog. The jobless woman told a district court on Tuesday (May 15) that Ron said to Mr Koh in Mandarin: "I was sent here to kill you." At the time, Ms Chen shared a flat with her other boyfriend, businessman Lim Hong Liang, 54, who owns SNL logistics. 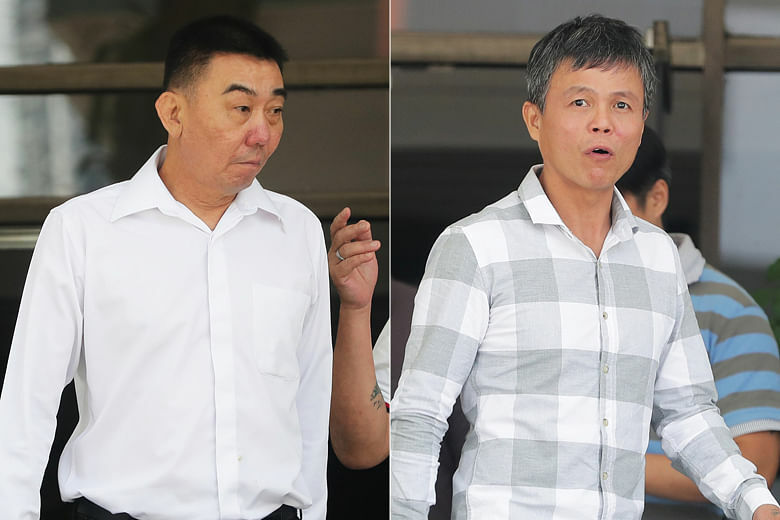 Lim and mover Ong Hock Chye, 47, are on trial for alleged involvement in a conspiracy to cause grievous hurt to Mr Koh on April 30, 2016. Mr Koh's face was slashed with a penknife, causing permanent disfiguration, in Townshend Road near Little India at around 1am that day. Taking the stand on the first day of the trial, Ms Chen told District Judge Chay Yuen Fatt that she was a beauty queen who won the inaugural Miss Mermaid pageant. She became Mr Koh's girlfriend in the same month he was attacked. Ms Chen testified that a friend introduced her to Lim in mid 2014 and they soon became intimate. She was aware he was a married father. The court heard that the businessman employed her as an "admin executive" in November 2014. Even though she did not report to work, he paid her a monthly salary of about $2,000 along with Central Provident Fund contributions of about $900 a month. Ms Chen told the court that he bought her a white Mercedes-Benz in February 2016 which had a number plate displaying her birth year - 1991. She moved in with Lim in January 2016 at an apartment at The Parc Condominium in West Coast Walk with a maid and a dog. Ms Chen told the court that she lived there rent-free. Lim also gave her other items including credit cards and cash. She said: "He supported me financially." While Lim was overseas, Mr Koh went to the flat to see her on April 8, 2016. Later that evening, she heard a gate opening and two men - Lim's son and Ron - appeared at the entrance of her bedroom. She told Judge Chay that Ron started to kick and punch Mr Koh while Lim's son, who did not take part in the assault, sat in the living room and played with her dog. Ms Chen testified that by the time Ron stopped the attack about 15 minutes later, the bedroom wall and floor were stained with Mr Koh's blood. She added: "I was in a state of shock. The assault lasted 10 to 15 minutes... Josh didn't retaliate." Mr Koh was taken to hospital and he called the police who arrived later that evening. When Deputy Public Prosecutor Tan Wen Hsien asked Ms Chen if she knew why Ron assaulted Mr Koh, she replied: "I don't know Ron... I believe it's because of Mr Lim." After the assault, Ms Chen told the court that she received a few voice messages in Mandarin from Lim. They were played in court on Tuesday and in one of them, a man was heard saying: "What you did was right or wrong? You brought a man to sleep while I was overseas. I provided you with everything... Do some reflection." Ms Chen testified that after the attack, she lived with Mr Koh in hotel rooms for about two months. She added that he was sent to jail to serve a three-week sentence in June 2016 of a forgery-related offence. Feeling “confused”, she decided to go back to Lim. Ms Chen told the court that she chose to cut off ties with the older man in May last year before moving out of their apartment three months later. To date, five people have been dealt with court for their involvement in the case. They are: Nur Atika Fauziana Sherhan, 20; Lim's nephew, Ron Lim De Mai, 26; Nur Muhammad Irwan Mohd Ngat, 29; Juhari Ab Karim, 34 and former technician Mohammad Amin Aman, 47. Atika, the only woman, was ordered to undergo reformative training. The four men were given jail sentences of up to 14½ years. Three of them, including Ron Lim, were also sentenced to caning. The trial continues.